The Bachelor of Science in Aircraft Maintenance Technology offered in this institution is a four-year intensive program designed to prepare students in the highly competitive and technical aviation industry. 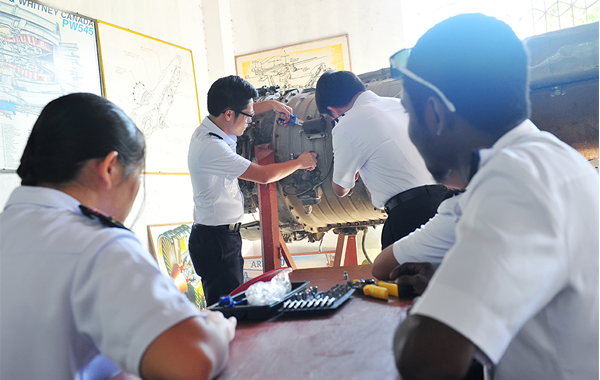 Students of the program are taught how to repair, overhaul, inspect, and modify small and wide-bodied aircrafts. All aircrafts must carry a valid Certificate of Airworthiness to be legally allowed to fly. In order for this to be valid all maintenance work to be done on an aircraft should be certified by a licensed Aircraft Mechanic. Completion of the program will qualify the graduate for the Airframe and Powerplant licensure exam of the Civil Aviation Authority of the Philippines (CAAP). Upon completion of the first two years of the course, the student will be conferred the certificate of Associate in Aircraft MaintenanceTechnology, provided he/she has undergone 2,400 hours ON THE JOB TRAINING in a CAAP Approved Maintenance Organization. Upon completion of the four-year course, the student will be conferred the degree in Bachelor of Science in Aircraft Maintenance Technology provided he/she has indergone 1,200 hours ON THE JOB TRAINING in a CAAP Approved Maintenance Organization.